Previously this tutorial involved editing the page.php file and forcing comments on the page. This no longer appears to work in the latest version of WordPress and Divi. The following solution is more simple and tested in latest versions. The first thing you need to do is make sure comments are turned on in WordPress for your website. Go to Settings-> Discussion and allow people to post comments on articles. Next we need to turn comments on for pages in Divi. Go to Divi-> Theme Options ->Layout -> Single Page Layout and turn on Show comments on pages. 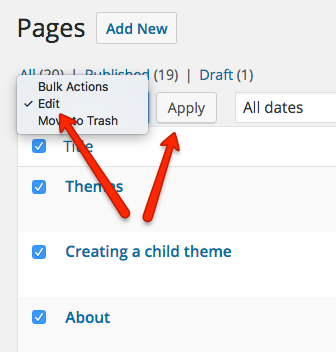 By default, event with these options on, WordPress will not turn on comments for pages that have already been published. We’ll need to do that manually, but there is a quick way to do it. Click on Pages-> All Pages. Above your first page in the table and below the Bulk Actions dropdown on the far left side of your screen, click on the checkbox beside Title. This will select all pages (up to 20 by default). If you have more than 20 pages, you can click on Screen Options and display more than 20 at a time. If you change the default 20 pages, click Apply and then go back and check the checkbox beside Title to select all pages. Next we need to click on the Bulk Actions select above the Title checkbox. Select the Edit option and then click Apply. On the Bulk Edit screen that appears, we need to click on the Comments select box and change it to Allow. Then we just need to click on the Update button in the bottom right of the Bulk Edit screen. This will turn on comments for all existing pages. You can also remove specific pages by clicking on the X to the left of individual pages before clicking Update. Now that all pages have comments enabled, we need to add some CSS specific to Divi Page Builder pages. Without this CSS, the comments will stretch across the entire width of the screen. The following CSS restricts comments within the same limits as a Divi row. If you have your Divi rows set to be wider than the default 1080px, you’ll want to modify the max-width to that number. That’s it! Comments are now enabled and displaying correctly for every page on your website. 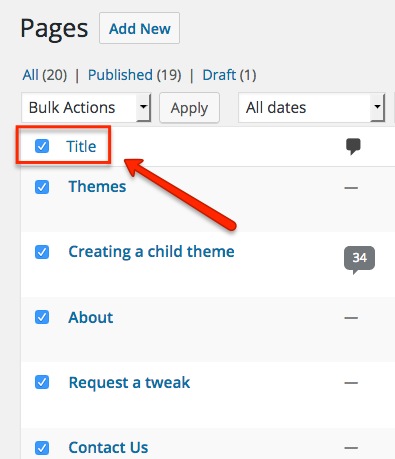 By default, WordPress will not turn on comments for new pages, even with comments turned on. To allow comments for new pages, simply quick edit the new page in the Pages-> All Pages view and click on the checkbox next to Allow Comments and then click Update. Unfortunately you’ll have to do this every time you create a new page if you want comments on that page. The same process can be applied to posts in Divi. Make sure you turn on comments in posts. Go to Divi-> Theme Options ->Layout -> Single Post Layout and turn on Show comments on posts. Then go to Posts-> All Posts to bulk edit all existing posts and turn on comments. The only difference is that new posts will automatically have comments enabled. You won’t need to quick edit each new post published after turning on post comments. Thank you so much! This was detailed, helpful, clear and easy. And it helped me make a beautiful page while preserving everyone’s comments & contributions. This doesn’t work. The #comment-wrap element is still not generated on the page. Disregard my previous comment… It turned out to be a conflict with the Owl Carousel that was also on the page (via a shortcode in a Code Divi Module). can I still replace it? on my page.php file code line that you want me to replace I have the word “false” instead of “on” what does it mean? should i still replace it? So, I tried the second option you suggested and the comments were added but they were added on the footer not on the body and it looks very weird. Doesn’t work. Comments are enabled for pages, and enabled on WP settings, still don’t show up for pages. This is just what I was looking for. Great instructions. But as you know the second option no longer works. I got the first option to work but as someone else said it puts the comment block between the page and the footer which is not great. Is there any way to add this with a shortcode where we would WANT it on the page? Or are there other viable options? We only need comments on one page! Thanks. Did you find a way to remove the comment block between the header and footer and move it elsewhere on the page? Sheila, you can use the global Pages > Edit option to turn off comments on all pages in one fell swoop. Then you can enable comments as needed per page. I know this post is like 2 years old but people are still having problems with the Divi comments module. I applied Method 1 above but it didn’t work. I actually got the solution by searching on the Elegant Themes support site. I made a post about it (and linked back to this site) so if anyone is looking for a solution, check out my post. I hope this helps. Thanks for sharing Angie. This tutorial was originally meant for pages, which is more difficult to enable comments for than posts. But the old method no longer works. I’ve updated with a newer method that works for pages and posts. Could you please share how you made the comments on this page look the way they do? With the avatar, name and date on the bottom with a cool circle and everything? Thank you! I have puzzled over this for a couple of weeks. Appears to be working right now.